Paul Klee’s highly individual, abstract style was influenced by the Surrealism movement and reflects his dry humour and sometimes childlike perspective. 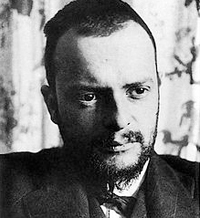 About the artist: Paul Klee (1879 – 1940) was a Swiss German artist. His highly individual style was influenced by movements in art that included Expressionism, Cubism and Surrealism. Klee was a natural draftsman who experimented with and deeply explored colour theory, writing about it extensively. His lectures, Writings on Form and Design Theory, are held to be as important for modern art as Leonardo da Vinci’s A Treatise on Painting was for the Renaissance. He continued to paint during World War I and managed to exhibit in several shows. By 1917, Klee’s work was selling well and acclaimed by art critics as the best of the new German artists. Klee and his colleague, Russian painter Wassily Kandinsky, both taught at the Bauhaus school of art, design and architecture. Klee suffered from a wasting disease, scleroderma, toward the end of his life, enduring pain that seems to be reflected in his last works of art. One of his last paintings, Death and Fire, features a skull in the centre with the German word for death, ‘Tod’, appearing in the face.